welcome to Leather Luster, Inc.
Let Us Shine Your Leather! THIS STUFF IS AMAZING! I ride Dressage (horseback-riding) and for YEARS I have wanted patent leather boots but not the patent leather price! FINALLY (after 15 years of riding) I stumbled upon this product and let me tell you, I am wondering how in the heck I have never heard of this stuff before! Easy application and it gave new life to my old show boots! Literally look like the expensive patent leather without the price. BEST BANG FOR YOUR BUCK! I use this for my Navy combat boots to keep them shiny and it definitely does the trick, they look like glass. Mirror like finish that lasts and lasts!! An awesome product that I have been using since 1995 and I love it! Service personnel best friend!! I don't rate products 5-star much, but this deserves it!!! A+ Inspection certified. High Gloss Shine. 100% Satisfaction! Do you want to represent yourself, and your department with the up most integrity and honor? 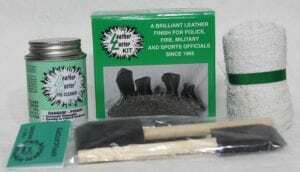 This product will definitely assist in keeping your duty belt gear highly glossed and shined. This product is a miracle, nothing like it, sustained, shiny luster. Used this product for over twenty years and it is very durable. 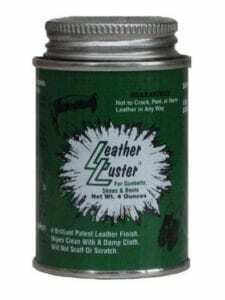 Leather Luster is the best thing since sliced bread!!!!! Restored my work boots and with a shine that I could see myself in!! I am a combat wounded Vietnam veteran, and during my life after getting out, I have done work as security officer, law enforcement officer, auxiliary on the Ohio State Patrol. Always have used Leather Luster to make sure I looked/met the standards of wearing a uniform. Great product!! Want to make other officers jealous? Then look no further! 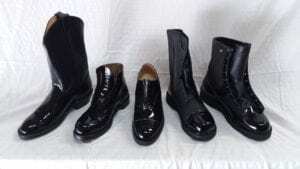 I've used Leather Luster for the past 6 years, your boots will look like little mirrors, without the painstaking hours of traditionally shinning them. Almost 29 yrs. active duty military and wish I had known about this years ago! First time using the product and all I can say is WOW!!! No more hours of polishing! Simply follow the directions and it works! This product works amazing. I have gotten nothing but compliments and people I work with all want me to do their boots now. I find myself constantly staring at my boots while I work. I work in law enforcement and look more professional with these shined boots. I have the best boots in the academy and I never have to shine! This is by far the best on the market for boots and gun belts. You will get complements from almost everyone that see's the finished product; So, get ready to tell a lot of people how easy it is, to look so good. Awesome product I used this polish in the Military for a high gloss shine. You will not be disappointed I assure you!!! I have to keep clean, shiny boots or face disciplinary action. Applied it June 16th and now it’s October 6th- yes, the boots now have the normal wrinkles where my foot bends as I walk but NO- there are no cracks, no peeling, no problems. I’ve been through the woods, through creeks, through briars, kicked stairs, kicked the emergency brake and still have an amazing looking set of boots. I used to spend 30 minutes a night shining my boots and now I spend less than 5 minutes each day before work. 4 months of wear and I still have the best-looking boots among my co-workers. Proof is in the pudding. I still have a pair of my military dress shoes coated with this stuff. Mind you I treated them in 1993 (over 20yrs ago) after buying this stuff in the PX. They will not crack or peel or damage the leather so long as you apply it correctly. The product is still packaged the same, looks, smells and applies the same way as it did over 20yrs ago. Hands down beats spending days of free time to get the initial spit shine and 30min to an hour every night touching up. Scuffs are easy to treat in accordance with the instructions but rare. Be patient, preparation is just as important as application. One of the best products I've ever used. My subordinates and my peers have made comments on the shine my boots exhibit. Very impressed and deserving of praise! Heard horrible stories about people using this. Then actually met someone that used it. Have to say never been happier. Boots look sharp easy to maintain the shine. Doesn't scuff as easy as kiwi. Will be using this from now on to stay looking sharp. I first bought this in 1979, it was hard to get then. I did my police boots with this once and they lasted until 2002 when I retired.